The flag of King Idris, the stooge monarch imposed by Britain and the US after WWII, was everywhere carried by the Benghazi rebels. He and it were overthrown by Gaddafi in 1969. Its return was for this author a sure indication of the politics of this bogus “revolution”. That there is something called a ‘democratic revolution’ or ‘Arab revolution’ spreading in this whole region and every country’s conflicts are basically national manifestations of this same pan-Arab phenomenon. That the Libyan and maybe Syrian “revolutions” had an “emancipatory content” from a ‘popular militia’ with a ‘popular political impetus’ from the beginning which may or may not now be gone in Libya because of the bombing but whose revival we must fervently wish and work towards. Let us first look at the character of the revolutions in Tunisia and Egypt. These revolutions were dominated from the beginning by the middles classes and by opportunist politicians, to a far greater extent in Egypt than in Tunisia. They sucked in big numbers of unemployed youth, who became the political playthings of these opportunists. They had an agenda; to use the radicalisation of the masses, the explosion of their suppressed outrage, for their own political ends; to allow a more ‘democratic’ and therefore better-functioning capitalist society, to allow more successful penetration of global finance capital from the US and EU the better to exploit the working class. There were two barriers to this ambition, the existing regimes and the working class. The regimes have shown their flexibility on instructions from Obama after initial fierce resistance so the problem now remaining is how to manoeuvre themselves into power without awaking the sleeping giant of the working class, particularly the Egyptian working class, and thus subvert the revolutionary potential of the movement. One phenomenon has been remarkable by its relative suppression in these ‘revolutions’ (so far not progressed beyond pre-revolutionary uprisings) which has rendered them ideologically flaccid from the outset; there has been no mass burnings of the US and Israeli flags and almost no portraits of Gamal Abdel Nasser Hussein (we have heard of just one) carried by the masses, not even in Cairo. There was therefore no consistent solidarity expressed with the oppressed Palestinian masses and they did not develop into a rush to the border to liberate the besieged inhabitants of Gaza as every leftist and revolutionary had hoped would be the first task of any revolution in Egypt. In fact one of the first actions of the new Egyptian regime was to reaffirm its co-oppression of the Gaza strip and its total collaboration with the Israeli Zionist regime in this. Of vital assistance in preventing this deepening of the revolution was the Muslim Brotherhood, who were prepared to sponsor such flag burning in angry demonstrations in the past in response to Zionist outrages, Lebanon, the bombing of Gaza, etc. But to sponsor such events now in the midst of this revolutionary upsurge would be to unleash the full force of the revolution; hence the caution and conservatism of the Brotherhood and the constant warnings from the Imperialist mass media of the dangers of an Islamic fundamentalist takeover of the revolution. The fear of Cairo’s fifteen million who could annihilate the entire capitalist order in hours was palpable. A public manifestation of anti-Zionism in the revolution: The Israeli flag on Mubarak’s forehead links him with Zionism. But in that chaos the only force who could take command to carry the revolution forwards was Egypt’s powerful organised working class, in constant militant struggle for some five years now. And when they stirred in mass strike action Mubarak went and the regime almost immediately adapted its profile and introduced some reforms, the better to survive. But neither did the working class struggles make their connections with the Palestinians and anti-Imperialism in general. The long dominance of the pro-regime trade union bureaucratic leadership had inculcated a syndicalist, workerist culture which ignored the Palestinians, in the name of opposition to Islamic fundamentalism, and the newly emerging independent trade unions have not proved capable of overcoming this. Assisting the bureaucracy in this separation of militant trade unionism and revolutionary anti-Zionism and anti-Imperialism was the fact that this latter was practically monopolised by the Brotherhood and there were a big proportion of working women in the cotton industry. These did not want the ideological subordination of women that the Brotherhood represented. It is therefore vital to fight for the working class movement in the shape of the new independent trade union federation, the Egyptian Federation of Independent Trade Unions, champion the cause of women’s oppression and equally the cause of the oppressed Palestinians in Gaza and the West Bank. But the US AFL-CIO and the International Labor Organization (ILO) are working overtime to ensure that does not happen. The collaboration between the secular pro-Imperialist Mohamed Mustafa ElBaradei and what he represented and the Muslim Brotherhood has so far succeeded in suppressing these powerful anti-Imperialist sentiments, which have emerged at times showing they are deeply held amongst the working class and oppressed in Egypt and Tunisia and throughout the region. Their dominance would be heralded by far more flag burning and the portraits of Nasser and chanting of “down with US Imperialism, down with Zionism, long live the memory of Nasser”. Then the Permanent Revolution would be emerging in full flight, then revolutionary Trotskyism would be vindicated and the intervention of a revolutionary socialist Trotskyist party would be facilitated by events. But the ideological grip of the collaboration of the pro-Imperialist secularists and the pro-Imperialist Islamists (whose anti-Imperialism has now shown itself to be purely opportunist, as distinct from that of the masses) has proved strong enough so far to blunt the revolutionary trust of the Egyptian masses and that of the rest of the region. And that was the great fear of Imperialism and their stooges in the region; the ideologues of Imperialism constantly propagated against this by warning of the dangers of Islamic fundamentalism (which they deny entirely in Libya). The entry onto the stage of the multi-million oppressed masses had of necessity to contain Islamic prejudices along with anti-Imperialism, to reject the whole movement because of this fear was to reject the revolution; that was how its entry had to be announced. The Muslim masses would naturally look to the organised working class as leaders because they constitute a big part of their numbers and are the only really revolutionary force that can take the revolution to its conclusion. Therefore they would be directed in the direction of revolutionary Trotskyism and Permanent Revolution. That is only in a global struggle against the dominance of world Imperialism and international finance capital can this revolution succeed. That is lodged in the consciousness of the masses; they realise their global dependence on world trade and finance capital. That is why ‘democratic revolutions’ and ‘the Arab Revolution’ are fraudulent conceptions, alien to Trotskyism. They are all versions of socialism in a single country, of a revolution in distinct and separated stages, which will herald ultimately the death of the revolutionary upsurge if this counter-revolutionary theory is not overcome. This fact that anti-Imperialism did not ideologically dominate was a weakness that was to prove debilitating as events unfolded in Libya. Because if anti-Imperialism, which had shown itself at times by support for the Palestinian masses and anti-Zionism, was not an indispensable part of this revolutionary upsurge how bad could pro-Imperialism be, provided we accepted this was just a first stage; a ‘democratic revolution’? Not so bad at all the Imperialist mass media was able to shout, this really was a ‘democratic revolution’ against all the bad local despots, close friends or inconsistent foes of Imperialist interests alike. As for that tyrant Gaddafi (foremost opponent of Zionism in the whole region), forget about anti-Imperialism, what we need is “freedom, justice and democracy” and once we get that we can think about the bigger picture later. Gaddafi is “Imperialism’s strongman in the region”, one former leftist confidently assured us just as they were about to bomb him. One wonders what they do to their enemies if this is what they do to their friends. That is how the Imperialist mass media propagated a separate and distinct stage in this revolution. Outrageously, in the name of the ‘wider revolution in the region’ we were asked by so-called orthodox Trotskyists to swallow all of this and not make the connection with the worldwide socialist revolution that Lenin made with the April Theses and Trotsky and genuine Trotskyists have made ever since via the theory of Permanent Revolution. Instead we must forget about our whole history of the fight for world revolution and the plight of the oppressed Palestinians and all the others and accept the humanitarian claptrap of world Imperialism’s mass media as the genuine article. We must concentrate instead on building, not socialism in a single country but democratic capitalism in a single country or at best in a single region via the ‘democratic’ or ‘Arab revolution’ as our first stage. The ideological collapse from the standpoint of orthodox Trotskyism of those self professed Trotskyists who took this line could not be greater. They completely ignore the fight for ideological leadership of the masses, have accepted outright reactionaries as leading a ‘democratic revolution’ far better than the much maligned Michel Pablo, Ernest Mandel or Gerry Healy ever did. They, after all, chose leftist opponents of Stalinism and Imperialism in the beginning as adequate substitutes for revolutionary Trotskyism to carry forward the objectively unfolding world revolution, at least until the late 70s when Healy picked Arafat and Saddam Hussein and he, the USFI and others backed the fundamentalist Ayatollah Khomeini, who propagated anti-Imperialism as the source of their power. Our current jokers are telling us that outright, self-declared reactionary pro-Imperialists are leading this so-called revolution and implicitly that the movement is so powerful that it can do away with the need for conscious revolutionary leadership entirely and be represented adequately by its open opponents. A more foolish political scenario is impossible to imagine. Some even warn us not to put any trust in them (but, of course, do not fight to overthrow them, we cannot change horses in mid-stream, they are ‘democrats’ after all, are they not?). These former leftists are attempting to perpetrate wholesale fraud on the world working class. “The lack of a revolutionary working class is a central factor why Libya was different to the other countries.” Might be connected with those murders of black workers, Simon. And anyway we had a very adequate substitute; those CIA-sponsored reactionaries will do the job just as well. “As the fighting rages in Libya sinister forces in the western world gather” Indeed they do, Simon, those CIA agents plotting with their Imperialist sponsored clients in Benghazi we suppose? “False Pretext Number One: “to protect civilians”. You see comrades by ‘democracy’ the Imperialists mean the right of finance capital to penetrate that economy at will and exploit its people and rob its natural resources. If we had a real successful revolution in any or all of these countries it would not be called a ‘democratic revolution’ at all, but the dictatorship of the proletariat. And it would have to do many of the things that that old dictator Gaddafi has done in the past to ensure survival. That is it would have to execute the counter-revolutionaries, the CIA agents and their unfortunate deluded and confused followers just like the Bolsheviks. With the working class in the saddle it would be the majority class and would not suppress workers’ organisations as he has done, but ensconce them as the ruling class. And it would be the victim of vicious lying Imperialist propaganda, just as the early Soviets were, just as Stalin’s regime was and China, Cuba, North Korea and Libya are today. We would have to sort out the truth from the lies, to defend the gains of the revolutions whilst rejecting those leaderships who were merely protecting them as the source of their own privileges. And there would be plenty soft left groups like Workers Power to swallow whole the lies and regurgitate them for us with a leftist, ‘Trotskyist’ gloss. The Workers Power stuff is an incredible mass of self contradictory nonsense, just like their line on the Balkans in the 1990s. The ‘revolutionaries’ who are led by reactionaries are fighting the reactionaries who are led by worse reactionaries, it seems. There is no revolutionary working class; nevertheless this revolution is unfolding in a continuation of the struggles for ‘democracy’ and the ‘democratic revolution’ in Egypt and Tunisia, where the working class is playing a vital role. There is no mention that Gadaffi was a bulwark against Imperialist finance capital and Zionism just some puerile tut-tutting about the pro-Imperialism of the leaders these ‘revolutionaries’ unfortunately have got right now. U.S. Secretary of State Hillary Clinton (left) and Kosovo Prime Minister Hashim Thaci now resigned. He is “the head of the mafia here” says Florin Krasniqi. Gaddafi is a bourgeois nationalist who is clearly one of the most substantial opponents of Imperialism left, albeit in the interests of local, corrupt capitalists like his own family. The following story puts this in context: “Singer Nelly Furtado has said that she will give away $1 million (£615,000) she was paid to perform for the family of Libyan leader Muammar Gaddafi. The star said on Twitter she had given a private 45-minute show for Gaddafi’s “clan” in 2007 at a hotel in Italy.” So no political support for Gadddafi and his regime but unquestionably a Military United Front with them against both Imperialism and their local agents, the rebels, who are clearly now one fighting force, one army with one agreed goal; in return for installing them as their puppet government Imperialist finance capital gets Libya. Whilst the whole article makes the totally unwarranted assumption that the rebels are genuine revolutionaries, despite their leaders, the last is just a sick joke. A “free election” for a bourgeois parliament like we have in Iran and Afghanistan? Anti-Imperialist forces will naturally be prohibited from standing in this capitalist democracy which is must be our goal now. This is an explicit repudiation of Trotskyism. This is just pathetic nonsense from out ‘left turning’ NPA, as Workers Power so badly characterised this group. The usual crap about ‘freedom and democracy’ as if the author had never turned a page of Trotsky or Lenin. Dave Beddgood and Charles Rachlis: “The aim of the Transitional National Council is to steer Libya during the interim period that will come after its complete liberation and the destruction of Gaddafi’s oppressive regime. It will guide the country to free elections and the establishment of a constitution for Libya.” An we all know how that worked out, surely one of the most disastrously wrong perspectives ever! This is a total capitulation to Imperialist propaganda, particularly the ridiculous notion that not only was there something called “the Arab Revolution” which was above class, but that it moved forward of its own objective volition irrespective of the leadership that it had and that the counter-revolution was represented only by Gaddafi and not world Imperialism. And why would they have to invade to impose “a new compliant national leadership” when they already supposedly had one? And the notion that the Imperialist-sponsored and CIA directed and funded ITNC was going to “guide the country to free elections and the establishment of a constitution for Libya” is just too silly for words; an idealistic and achievable aspiration for a bourgeois republic and a two stage revolution. Where is the evidence for these lurid claims? There is none because it is a complete lie. No need for that, Imperialism is on the case on your behalf. The Liaison Committee cannot see the contradictions between Imperialism and bourgeois nationalist regimes, the Leninist distinction between oppressed and oppressor nations, and can imagine no good reason apart from subverting the ‘revolution’ for them to sponsor the rebels. This is indeed becoming a very tangled web. The truth is that what the Liaison Committee correctly labels a “national bourgeois crony capitalist regime” is at severe odds with Imperialism because there is a very great deal left of the Libyan revolution of 1969 worth defending and the masses now increasingly rallying to Gaddafi realise this. And the ranks of the rebels realise this also, they do not know why they are fighting, which is why they appear so cowardly and half-hearted in their struggle. Installing puppets for Imperialism is not a strongly motivating ideal so they run away from the first sound of gunfire. 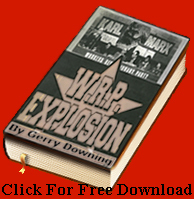 It is true that Gerry Healy and the WRP did capitulate to the Arab bourgeoisie and that the present-day WRP continues that line. But Healy’s most vociferous opponent before the 1985 split was Sean Matgamna of the AWL. He supported imperialism against the same Arab bourgeoisie and he has continued the same line ever since. Although we totally denounced Vanessa Redgrave’s attempts to bring the AWL to court for this I and another Central Committee member in the post-split WRP refused an invite from Matgamna to speak at a public meeting denouncing Redgrave because we would not be associated then or now with an attack on Gaddafi from the right. The nonsense about “disarming the Libyan people’ from those who are now the spokespeople for Imperialism is just total nonsense as is the stuff about the “Arab Revolution”. “But there is real hope and excitement in the free cities. It may be that a potential No Fly Zone could tip the balance in the favour of the rebels — in that sense we should not take a stand against such a policy, even if we would not critically support it with all that that that implies. Martyn has no illusions in what the leadership of the ‘rebels’ will do to the workers, nevertheless he has picked his (pro-Imperialist naturally) side so he is for bombing by Imperialist forces – won’t take a stand against it – but will not critically endorse it either. And he has the cheek to invoke Trotsky’s name for this anti-working class bile! Every sentence and phrase of this is dripping in pro-Imperialist chauvinist bigotry. We will leave the reader to decide who is a shameful disgrace in here – Bradley is objecting to the pacifist Stop the War picket against Imperialist intervention! The Socialist Party too capitulated and sided with the rebels, as we would expect but it made some correct demands in The Socialist, 3 March 2011. If these demands, for committees to represent the workers, for independent trade unions, for a constituent assembly, etc. were equally pitched at Gaddafi’s supporters and called for a united front against the rebel leaders then they would form part of a programme for the Permanent Revolution. As it is they are simply a cover for Imperialism. Although they back the rebels, they do the more leftist thing of also opposing Imperialist intervention. A survey of the left will show that only the AWL supports this, Workers Power is ambiguous, saying the rebels are right to take advantage of the bombing that they demanded but which Workers Power oppose. Logically the AWL are right, then. If the ‘revolution’ is to succeed it can only do so with the assistance of ‘the international community’ so let us go with that. Hold on, treachery say our leftists, the Imperialists intervened only to subvert the revolution not help it. Nonsense, the AWL might truthfully say, these people made their politics clear from the outset, they never wavered in their pro-Imperialism and we have never wavered in our support of them, we are the real social Imperialist, you are only our shamefaced imitators. But the SP spot another problem. There is something to defend in Libya which these rebels might be endangering, they imply. In fact they are immediately threatening all the gains of the 1969 revolution. But what revolution is the SP defending? They manage to fudge this because they are political enough to spot some problems coming up and do not want to be stranded on the wrong side completely. “His own people’s upsurge” was a putsch organised by extreme reactionary leaders, whose political credentials these comrades did not even think worth checking. Because obviously this objectively unfolding revolution had no need of revolutionary leaders, reactionary ones were just as good. And then they accuse us of capitulating to Nasser and Gaddafi! Of course the Socialist Fight article did not give uncritical support to Gaddafi against the rebels, the support was critical and against the internal agents of Imperialism as well as their allies, the Imperialists bombers themselves. These ‘revolutionaries’ (some still follow The Guardian in designating them thus) called in Imperialist bombing of their own country and people, have made the country’s oil resources available to Imperialism in return for puppet status, just as their ideologue whose flag they wave, King Idris, did up to 1969. Neither did they enquire why these ‘revolutionaries’ felt it necessary to slaughter all those black workers. We would suggest it was because their leaders knew their racism and wished to encourage it by talk of ‘black mercenaries’ to ensure that the working class could not influence events in any way. Of course politically the working class could not have any independent existence when one group of workers were killing another, minority group. The working class was thereby ideologically and politically defeated at the outset of this ‘revolution’. These comrades think that there is still a huge political difference between the Imperialist war planes that bomb Gaddafi’s army and his civilian supporters and the rebels. But they are obviously part of the same war machine and are trying to win by following up the bombing as Imperialism’s foot soldiers, unfortunately for Sarkozy et al not very good ones. The CoReP statement complains that “The threat of interference of the Western armies” … has “politically strengthened Gaddafi.” That might be because he is fighting Imperialism and the rebels are supporting it. It makes a number of democratic demands, seemingly unaware that some of these have already been realised and under immediate threat from the Imperialist-sponsored rebels, whom they are supporting. On the emancipation of women for instance, Libya has the most progressive laws on women’s rights in the whole of the region. And we have seen above the real relationship between finance capital and Libya, it is severely inhibited and it wants its ‘freedom and democracy’ and it is confident that the rebels will give it to them. Without fighting global Imperialism, correctly identifying the local agents of Imperialism and making a Military United Front bloc with Gaddafi against it and its local agents the revolution cannot advance at all. You are only contributing to the political confusion and lining up with every Imperialist power and every reactionary Gulf state who were slaughtering their own genuine revolutionaries. Again that non-class and above class democratic revolution – “the revolution” which can be going in any direction, with any allies fighting for any cause as long as it is in pursuit of “extreme democracy”. It allows us to forget about the ‘democracy’ of the black workers lynched by these ‘democrats’ because they see what these reactionaries real intentions are; to become a puppet government on the basis of betraying their own national interests and selling out the remaining gains of the 1969 bourgeois revolution. And the real ‘democracy’ contested here is the right of finance capital to exploit the Libyan economy and rob its oil without all those ‘undemocratic’ restrictions imposed on it by that ‘evil dictator’ the ‘madman’ Gaddafi. The real scabs in this conflict are not the WRP and those Maoists and pan-Africanists who capitulate to the Bonapartist regime of Gaddafi but all those who call for the defeat of Gaddafi by the rebels and world Imperialism like the AWL. Those who equivocate on this by ignoring the political character of the rebels in the name of ‘the democratic revolution’ are at best Imperialism’s unwitting stooges. Those who take a neutral stance between the rebels and Gaddafi despite correctly analysing the character of the rebels are also unable to fight Imperialism by siding with and relating to the oppressed masses by correct transitional demands. The stance of the WRP in calling for victory to Gaddafi has raised the hackles of many leftists. But almost all these attacks are from the right. A leftist criticism would point out that the line does not counterpose the interests of the working class in Libya to this leftist bourgeois nationalist, who has moved to the right in recent years. They do make these criticisms but there is no political clarity; victory to Gaddafi certainly implies that he is capable of lasting victory and puts faith in him that he will not sell out. Supposing he does, would it not have been better to urge the Libyan workers to defend the gains made since 1969 with their own methods of struggle and organs of power against Gaddafi, although in temporary alliance? But Gaddafi opposed these revolutions because he is a bourgeois nationalist; asking him to urge “the Libyan masses to say what changes they wanted to see in Libya, as part of the struggle for a socialist North Africa” is to suppose he is some type of socialist or a blunted instrument of the socialist revolution, a very ‘Pabloite’ error. Politically Gaddafi is the same as Chiang Kai Shek and Trotsky’s attacks on Stalin before the 1927 massacre of the Shanghai soviet equally apply to the WRP today. “To fight in a United Revolutionary Front against the leaders of the reactionary uprising and at the same time they must campaign for the political power of a workers’ and small peasants’ revolutionary alliance” (The News Line: March 2011 ). But how could these two forces be termed, “qualitatively equivalent capitalist factions”, the one, Gaddafi’s government, was still defending the gains of the 1969 revolution, albeit in their own interests and by their own often reactionary methods. And how was the rebel’s political character and the attitude of revolutionaries to that suddenly transformed from neutrality to opposition by the dropping of NATO bombs? This is a cover for the initial flinch. In Libya North’s SEP advocates taking a permanent neutral stance between Gaddafi and the rebels because neither of these can represent the working class. Whilst correctly opposing the Imperialist bombing he refuses to make a Military United Front without political support with Gaddafi even now (which all the Spart family correctly do at that late stage) but he agrees with them that there is initially ‘no side’ in the conflict with the direct agents of Imperialism, the reactionary ‘rebels/revolutionaries’ of Benghazi. This leaves him to the right of the Sparts and takes a very wrong policy to its logical conclusion which chimes in with the interests of imperialism by a ‘purist’ reductionalism. This dismisses the Leninist distinction between oppressed and oppressor nations and leaves the theory of Permanent Revolution as a flaccid propaganda weapon with no application to the real world. The rebels were prepared to give the Imperialists everything in return for their patronage. Had they won in that first push Imperialism would have gained a very cheap victory. Failure to make a bloc without political support to Gaddafi at this stage meant that the ‘Spart family’ and the SEP still had illusions in the rebels and were victims of the ‘humanitarian’ propaganda war. The Imperialists and their lackeys throughout the world recognised their friends at once and chose sides without hesitation. The WRP is left Pabloite on Gaddafi, the Sparts, IG, and IBT initially choose no side; they took a third campist position. The SEP is third campist even now. But the soft left in general are merely Imperialist stooges but with a wide range of political differences. Conference officially forms new – and growing – independent union federation, 03/03/2011, http://www.egyptworkersolidarity.org/?p=309. Peter Main, Victory to the Libyan Revolution! http://www.fifthinternational.org/content/victory-libyan-revolution, 19/03/2011. Simon Hardy: Libya – a revolutionary civil war http://www.fifthinternational.org/content/libya-revolutionary-civil-war, 10/3/2001. Wikipedia, Organ theft in Kosovo, http://en.wikipedia.org/wiki/Organ_theft_in_Kosovo. Kosovo’s Mafia: How the US and allies ignore allegations of organized crime at the highest levels of a new democracy http://nuckinfutsnyc.blogspot.com/2011/03/kosovos-mafia-how-us-and-allies-ignore.html. Sinistra Critica (Critical Left), Gaddafi out! No to Imperialist military intervention! http://www.internationalviewpoint.org/spip.php?article2042 20th March 2011. Libya: no illusions in West but “anti-intervention” opposition is abandoning rebels http://www.workersliberty. The Socialist newspaper, Defend the Libyan revolution, No to Imperialist intervention http://www.socialistparty.org.uk30 March 2011. African Union ‘ignored’ over Libya crisis http://news.bbc.co.uk/1/hi/programmes/hardtalk/9436093.stm. 25 March 2011.